This drone motor calculator helps you determine the thrust required to get your drone up in the air. Whether you're an amateur building his first drone, an aerobatics expert or a photographer, you will surely find this tool to be of help. It's difficult to know the weight of your drone at the planning stage - after all, you didn't choose the motors yet, so how can you determine their weight? Nevertheless, a reasonable estimate is sufficient for our drone thrust calculator. You can always adjust it later, once you know more about the construction of your multicopter. Drone weight is the weight of the main body - the frame, motors, propellers, landing gear and so on. Battery weight is the weight of your LiPo battery. Equipment weight is the weight of detachable equipment - for example, if you're planning to use the drone for aerial photography, this will include the weight of the camera. Naturally, if you prefer to input the total weight of your drone directly, you can do it as well! Before you are able to determine the optimal thrust of the drone motor, you need to pick one more important parameter: the thrust to weight ratio. Manufacturers of drone motors express the thrust in grams or ounces. This is the weight that one motor is able to lift off the ground. It doesn't mean, though, that a thrust equal to the weight of the drone is sufficient! In most cases, you should plan for a 2:1 thrust to weight ratio, to allow your drone to hover at just half throttle. The higher the thrust to weight ratio, the easier it is to control your drone in elaborate aerobatics. You can use the 2:1 ratio for gentle flying (for example in the case of aerial photography), but if you're planning to shoot FPV (First Person View) videos or participate in races, you should consider ratios such as 4:1 or 5:1. Extreme aerobatic flying could require a ratio as high as 7:1. You should remember, though, that you will still need to accommodate a large battery if you want a high drone flying time. Enter the weight of your drone into the appropriate boxes. We will analyze a drone that has a body weighing 500 grams, and a 4S LiPo battery weighing 150 grams. Additionally, we want to attach an FPV camera that puts an additional 50 grams on our drone. Pick the thrust to weight ratio. Let's assume we just begun to learn shooting FPV videos, and a ratio of 3:1 will be sufficient. Determine the number of motors in your drone. We're building a quadcopter, so we will keep the default value of four. The drone motor calculator multiplies the total weight of our drone by the thrust to weight ratio and displays this value - in our case, 2100 grams - as the full thrust required for our drone. The last step is dividing the total thrust by the number of motors. We need four motors that will provide a thrust of at least 525 grams each. Now that you already know what thrust is needed to get your drone flying, you need to find a motor type that fulfills your requirements. Then, you can readjust the total drone weight to take into consideration the actual motor weight. For example, we found a drone motor that has a thrust of 550 grams, but it weighs 15 grams more than we expected. After inputting the new weight into the calculator, we discover that the required thrust is now equal to 536 grams, below the performance of the chosen motor. It means we can safely use it for our drone. 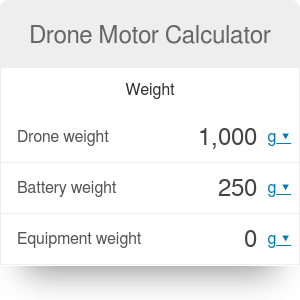 If you like our drone motor calculator, make sure to take a look at the battery capacity calculator, too! Drone Motor Calculator can be embedded on your website to enrich the content you wrote and make it easier for your visitors to understand your message.